The village is notable for the number of public houses. Twelve have been recorded over the last 200 years, but not all necessarily at the same time. Popularity can possibly be explained by the industrialisation of the village at this time. Workers from the mines, quarries as well as numerous boot factories would undoubtedly have been keen drinkers. The village was a major staging post location, providing for travellers making the trek across Longstone Moor between Sheffield and Manchester. The Stags Head was a coaching inn situated on High Street; as was the Moon Inn, originally known as the Old Moon Inn and situated across the road from the present day pub of the same name. The Lovers Leap was further up the village, towards Eyam, and still bears the same name, although now a restaurant. 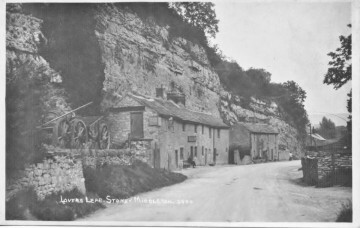 The Ball Inn was at the edge of the village at the junction to Eyam under the outcrop of rock known as Shining Cliff and was pulled down in 1921. The Half Moon, the Miners Arms, The Castle and The Sun(also known as the Denman Arms) were all located in The Nook. Two other pubs the Bulls Head and Barrel Inn were also in the village although their location is not known. The Royal Oak was a meeting place for the local hunt and the Grouse Inn (also known as the Boot and Shoe) were located across the road from each other on The Dale. What is Intriguing is the connection of these public houses to the true legends and folklore of the village. The Murder at the Old Moon Inn, the story of a Scottish peddler staying at the pub, while working at Eyam wakes had reported fellow peddlers for being unlicensed. Incensed they followed him home and murdered him later that night, disposing of his body under the cover of darkness. He was dumped down Carlswalk Cavern, a deep cavernous lead mine at the end of the village and there he lay for 20 years before being discovered and identified by the buckles on his shoes. The Lovers Leap taking its name from the leap of Hannah Baddeley from the cliff tops. Jilted and heartbroken after being rejected by the love of her life she decided to end it all by leaping from the high cliffs, miraculously she survived with minor injuries. The murder theme continues when in April 1758, richly attired lovers Allen & Clara, forbidden to marry by her father arrived at the Royal Oak to stay the night. The following morning they set off on horseback for Peak Forest (Derbyshire’s Gretna Green of the time) where they could be legally married. Sadly they never made it as they were murdered by five miners in the Winnats near Castleton for their valuables. Clara’s saddle was kept in the pub before it closed and now resides at the Castleton Museum. 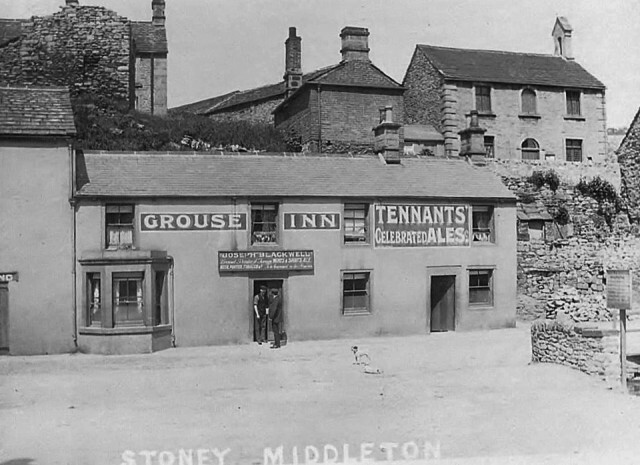 An account of the Old Inns and Public Houses in Stoney Middleton, together with the names and descriptions of their landlords. The ‘Old’ Moon Inn kept by John Froggatt is mentioned frequently in local newspapers as the place where property sales took place. John was the tenant and the owner of the Inn a member of the Strutt family. Mr Strut owned a substantial amount of land and proerty in th area.I share a Froggatt ancestor with John. He married Hannah Hawkesworth and there were three sons. When John died in 1791 the license was transferrred to Hannah. When Hannah died in 1805 her niece Hannah Froggatt claimed the tenancy but Mr Strutt turned her out and chose someone else.